Updated Tuesday February 9, 2016 by Erich Weiler. Listening – it is one of the most powerful E-Tank-fillers… adopt a “tell-me-more” attitude. Encourage your child to express themselves. And just as some actions are fillers, some can be drainers… be careful to avoid them. One common example is just by ignoring and not listening to your child. Another common one is sarcasm. Criticizing and making corrections during or after the game are drainers. Children know when they make mistakes or do not perform well; they don’t want to hear about it again. Also, non-verbal actions like hands on hips, frowns, eye rolling, crossed arms and heavy sighs are all E-Tank drainers. Practice filling your child’s E-Tank and see what happens. Try doing it for a spouse or co-worker. It takes practice but it feels great once you have mastered it. Volunteering in Little League is a family experience. It’s a time in your child’s life you’ll want to share. Every parent – mom and dad, Little League veteran and Little League novice -- should enjoy this one-of-a-kind experience with their child. Beginning with Tee Ball, parents can get involved with the maturation process together. As the child learns the game, the parent learns how to communicate and interact with their own child and other children on a cohesive, trusting progression. 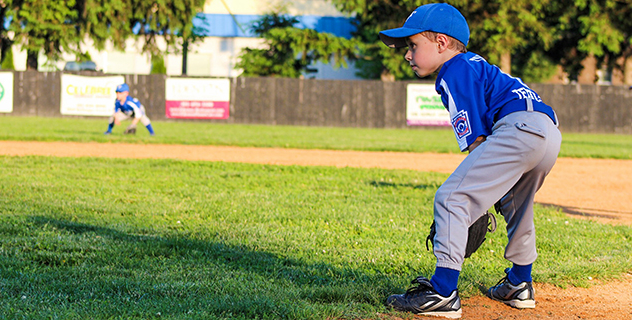 A parent-coach learns how to create a fun, introductory Little League experience for Tee Ball-age players. As the child moves up through the local league’s divisional structure, the parent-coach adds in more techniques for the increasing motor skills, while adding appropriate technique and skill training at each age level. Coaching one’s son or daughter is a unique opportunity to spend time with them and help with the life lessons that every parent values. These are memories, for both you and your child that will last forever. Watch baseball and softball in your community, or on TV. Check out the team roster and have the children pick a player (perhaps the one who plays the same position they do) and follow them on the field. Throughout the game, ask the kids questions about their player. Another way to personalize it is to teach geography. Buy a map and hang it on the wall. With each game you watch, place a pin in the cities the teams are from. If your child is computer knowledgeable, have them go online and find a few facts about the cities. When your child asks what games are on, pick games that you can attend or watch on TV, together. Choose a game that has a connection for you and your child. Examples are your favorite team or that of a grandparent, or sibling; or tie it into a location of the country that the child is studying in school. Picking teams to root for based on jersey color can also go a long way with children. You don’t have to over-think it or be the smartest person in the room; you just have to make it fun. Besides, it’s always more fun when you care about one of the teams. Older kids are more likely to see something and try to replicate it on the field. When the umpire makes a call, talk about it with your child. Do you both understand why the call was made? If not, talk together about what you think may have happened.